​Back to baking! I believe I was talking about cakes. Ah yes, wonderful, sweet, melt in your mouth cakes. There is just something about a good cake that can take you back to your childhood. All the delicious colorful birthday cakes, homemade or store bought, I never met a cake I didn’t like, and some of them I have LOVED! The process of cake making started in ancient Egypt, as an unleavened, unsweetened variety. They were “baked” over hot stones, and were hand blended and shaped. Usually only prepared for special occasions. By the late 1800’s chemical leaveners were introduced (baking powder, and baking soda). As these products became more refined cakes developed into what we think of today. There are two basic types of cakes. There are sponge cakes, aptly named for their sponginess, these cakes contain very little fat, and rely on the beating of a high proportion of eggs to flour to get the light texture that they’re known for (remember our “angel” of a cake a couple of posts ago?) . The second basic type of cake is a butter cake. Can you guess what these are made of? You bet, a high proportion of fat (butter, margarine, or shortening) coupled with a chemical leavener either baking soda or baking powder to help them rise. Butter cakes are a more dense cake, that have a moist texture. It stores well in the refrigerator, is easy to frost and fill, and is a quintessential cake in American baking. None other than the “birthday cake”. There are many types of butter cakes, yellow butter cake, white butter cake, chocolate butter cake, and even the gooey butter cake made famous in St. Louis MO. So what are the differences in these cakes? Some differences are obvious, chocolate cake contains chocolate for example. But some are a little more difficult to discern. The difference between yellow butter cake and white butter cake is that yellow butter cake contains only egg yolks, providing that beautiful golden color, and white butter cake contains whole eggs. But both are super yummy! I thought I would share with you my recipe for Yellow Butter Cake, so let’s get started. In traditional recipes for butter cake you would use a creaming method where you blend the butter and sugar together first then add eggs, flour, and milk. This method does work well, but it can cause a gluten affect in your flour, and your cake may not rise to the heights that you know it can. So I prefer a one bowl method. Preheat your oven to 350 degrees, and butter and flour 2- 9 inch cake pans lining the bottom with parchment paper, and set them aside. In a medium glass bowl blend egg yolks, 3/4 c. of milk, and vanilla. In you mixing bowl, add all dry ingredients, and blend together on low setting, add butter, and remaining milk and blend until moistened, mix on medium setting for another 1-2 minutes then begin to add the egg mixture continue beating as you go. Add slowly over about 3 minutes. Once well blended with out lumps, pour evenly into your prepared pans, and bake in preheated oven for 25-30 minutes or until toothpick comes out clean. Cool in the pans on a wire rack. Do Not frost until cakes have cooled completely or you’ll melt your frosting and make a mess. Trust me I have melted more frosting than I care to admit, I’m so impatient. Make your frosting while you wait for your cake to cool. In a double boiler add chocolate chips, milk, and butter. Stir over heat until smooth, add to mixer and beat in the confectioners sugar, and vanilla. Blend until smooth if lumpy run through a strainer. Refrigerate for at least one hour, then beat for 1-2 minutes before using. 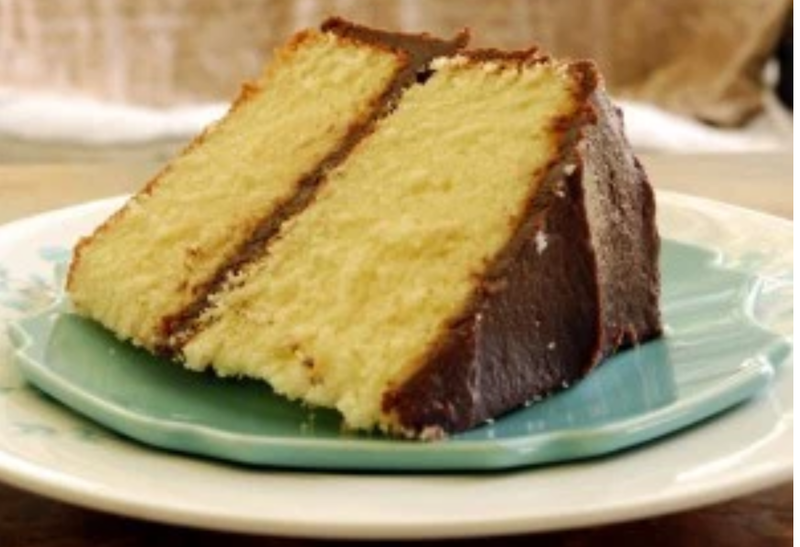 This is one of my favorite cake recipes, it melts in your mouth. The chocolate frosting is the perfect compliment, a sure fire success for birthdays or other gatherings. Enjoy!